Former Koln legend. Cullmann was very versatile player who played successfully in defence and midfield, and even in attack when needed. In Koln he played mainly as libero meanwhile in NT he was used in midfield. He was excellent in heading abilities often scoring after set pieces and he had good pace on the ball. Very skillful player, his great characteristic were excellent dribbling slaloms from defence in style of Franz Beckenbauer. Very calm on the ball, had also solid passing range and supported attacking moves of his teams. 341 Bundesliga games Bernd Cullmann completed 1969-1984 for the first FC Cologne and scored as a defensive player while at least 29 goals. There were also 40 caps and six goals, the participation at the world championships in 1974 and 1978 and at the European Championships 1980th At the World Cup '74 in Germany Cullmann played under then-head coach Helmut Schon three times and scored a goal in the 3-0 world champion in the later group game against Australia. "I have a problem, refer to me as a world champion because I have not played in the finals," says Cullmann, adding: "In Euro 1980 it was different because I've played in the finals and I am then for Hans-Peter Briegel. been a substitute. " At that time the European Championship tournament in Italy, he shared a room with a young star Bernd Schuster. The experience was most important for Cullmann but winning the doubles with his body and stomach club first FC Cologne, with whom he experienced the strangest things. And so will the season finale 1978th DFB Cup winners FC traveled to Hamburg on the 34th Match play against FC St. Pauli. FC manager Karl-Heinz Thielen had ordered an extra 15,000 tickets for the game has been moved to People's Park Stadium. "We are 3-0 and on the sidelines waving Hennes Weisweiler (then FC-Trainer/Anm's note.) Still wildly with his arms, so that we can play further forward we have just asked. What was he doing ? After the 4:0 and 5:0, it was quiet then. " After the final whistle only heard Cullmann and Co. of 12:0 between Borussia Dortmund and Borussia Dortmund. Only hours after that time had solved the disbelief and then was still celebrated in Hamburg. 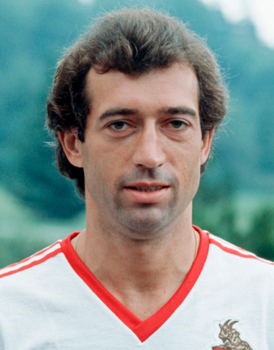 Bernd Cullmann can laugh about it today, he finally won with Cologne in 1977, 1978 and 1983, three times the pot. In 1984 he had his career end because of foot problems. For both big toe joints are now the primary use away. After the active career Cullmann worked as a representative for Adidas in the early 90s he moved to FC in the Board and from 1993 to 1996 Manager. In the same work he also worked one year at MSV Duisburg (1999-2000). Since 2000 Bernd Cullmann is as a player consultant, together with his longtime partner and friend Wolfgang Fahrian. Cullmann plays football for years no longer fit he keeps himself on the bike trainer. And he sits at home every FC game on the platform of the World Cup stadium in Cologne. His son Carsten play also as a professional for the Koln.